where you’ve been and what you love — they’re part of your story. Like a cherished family heirloom or a memento from a wonderful trip, your most prized possessions have a deeper meaning than simply looking pretty or being on-trend. They’re special, because they have history. But sometimes even brand-new products have an interesting story to tell, if you only ask to hear it. Most Scentsy Warmers are handcrafted in China, with time-honored techniques by the best artisans in the world, made special and new with our own designs that blend materials, define trends and, yes, tell their own stories. The sweetgrass basket is one of the most coveted and culturally significant treasures in South Carolina’s Lowcountry. If you’ve ever been to Charleston, you’ve likely seen these beautiful works of art in shops and outdoor markets. To make our Sweetgrass Basket Warmer as authentic as possible, our designer selected his favorite basket and, together with our craftsman, got to work. First, the basket was taken apart so the individual layers could be applied to a mold to create the shape of the warmer. Then, the basket’s woven texture was cast to complete the Lowcountry look. Anyone who has ever dared to prepare an artichoke knows how difficult it can be to peel back the tough outer layers and get to the center! Artichokes are an enduring symbol of good fortune, due to their tender heart being guarded by those strong layers. Our Peace & Prosperity Warmer was designed to instill that same spirit of love, luck and protection in your home. Mosaic is a timeless style, but it’s also extremely time-consuming to create. Our mosaic warmers, Mended and Mosaic Mist, are no exception. Every one of our mosaic warmers is artfully designed and meticulously handcrafted with more than 200 hand-cut, hand-placed tiles. Millions of tiles will have been cut and placed by season’s end, to create enough warmers to fill homes all over the world with fragrance. At the end of the day, the décor you choose for your home should fill you with joy. What do you want to see when you walk through the doors? How do you want to feel? Whether you’re looking for a laugh, the comfort of a hug, the beauty of an enduring story or something visually striking, good design can supply it. 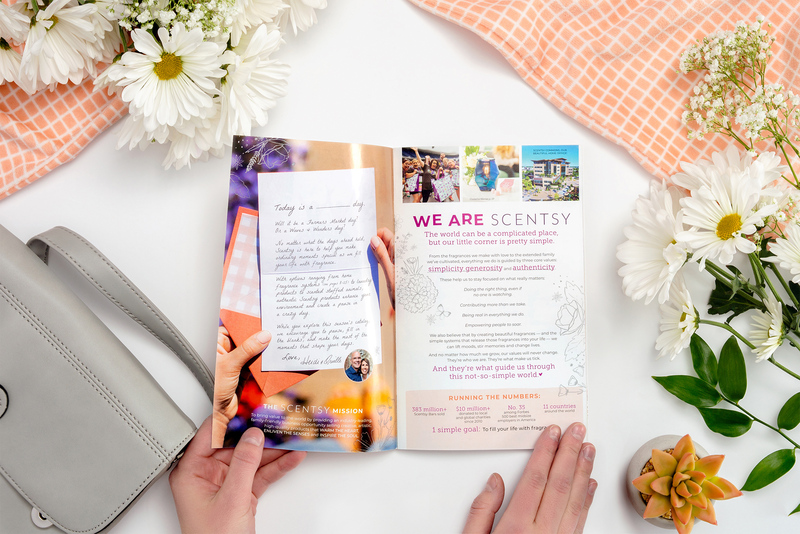 Our new Spring/Summer 2019 Catalog is filled to the brim with inspired warmer designs and many other beautiful, inventive ways to fill your life with fragrance and add new stories to your home. Reach out to your Consultant to experience all this and more. Don’t have a Consultant? Find one here. Separator image Posted in About Scentsy, Home Décor, Our Products.